Mad Catz recently released their latest product, Lynx wireless Xbox controller, this past December. I was rather disappointed and not optimistic upon looking at the package because I noticed the design of the Lynx wireless Xbox controller is based on the original Xbox controller, with only a slight modification in a little reduction in size. I was able to talk to Matthew Bennion, Business Development Manager at Mad Catz, and he assured the Controller S layout "will happen on the Lynx" sometime in the future." They just don't have a set date at the moment. 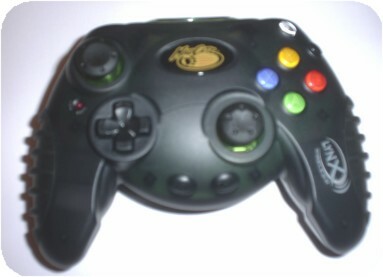 I know there are some who do prefer the original Xbox controller layout, so all is not lost here. This wireless controller does not depend on a clear line of sight from the Xbox to the controller. Your controls won't be intrupted if someone stands in your way. I tested this by setting my controller base unit to face on way while I went to another room and started press some buttons. I could tell that the controller was still able to function even though I was in a completely different room by just listening to the sound of the game. According to Mad Catz, the maximum range is 50 feet from the base unit. The controller does take up 3 AA batteries. On the Mad Catz website, it states that you are able to get up to "50 hours of continuous game play with vibration and up to 160 hours without vibration - longer than any other wireless controller on the market." 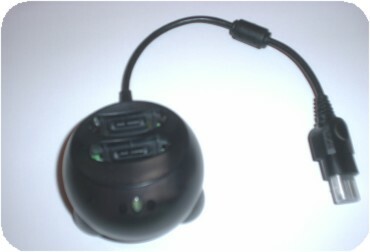 The two expansion slots usually found on the Xbox controller is found on the base unit. The only drawback here is that if you game on Xbox Live, you would need a wireless headset to go along with it since the memory card plugs into the base unit (obviously not connected to the controller), which would defeat the purpose of getting a wireless controller in the first place. Overall, if you are a person with big hands, or just prefer the original Xbox controller, the Mad Catz Lynx Wireless Xbox Controller would be a great addition for your Xbox. The controller retails for $59.99, which is a steep price for a controller, even if it is a wireless one, but the Lynx Wireless Xbox Controller is well worth the money. If you are in the market for a wireless controller, you can't go wrong with this Mad Catz Lynx Wireless Xbox Controller.